Did you enjoy The Grand Tour of Homes as much as we did? As interior designers we absorb every little detail so if you missed it, we’ll review three stand-outs. 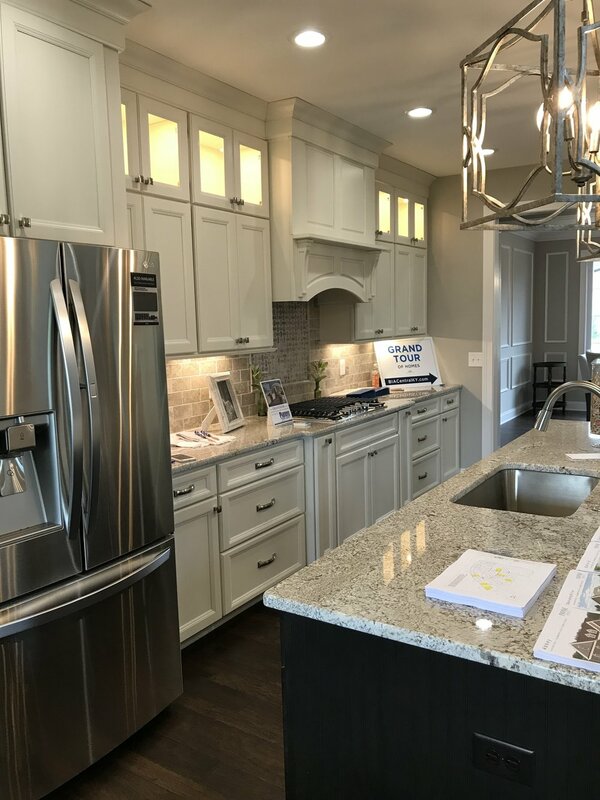 The Grand Tour of Homes is a scattered site, self-guided tour that featured 44 homes this year in Lexington and surrounding counties. The event is organized by the Building Industry Association of Central Kentucky (BIA). The tour featured 15 different builders in a variety of price ranges and styles. The first house that we’ll review is the Gray Gables model by builder, Jimmy Nash Homes. The variety of textures are so appealing with gray stained shake siding and white painted corbels. This house is a visual treat. Perhaps my favorite part about this exterior is just above the three small windows on the left. Notice the chunky molding and board-and-batten; it is so perfectly balanced. On the interior is our favorite kitchen from the tour. The subtle differences in textures makes this kitchen truly stunning. Notice the shiplap on the ceiling as well as the delicate detail on the glass cabinets are repeated on the island. The low-maintenance quartz countertops are mostly white with a little gray while the marble backsplash is mostly gray with a little white. This balance of color and texture keeps the space from feeling too stark or boring. The true showstopper here is obviously that fantastic range hood. I mean, really…there are no words. In the powder room we stumbled upon this beauty. Four of our favorite things: white marble, a vintage-inspired faucet, beaded details on the mirror, and hydrangea (seriously, you can put hydrangea anywhere and it is instantly more romantic). Sometimes I find myself studying rooms or photos of rooms searching for what it is that makes it so perfect. In this space I think it is the little extra ogee detail around the sink and the backsplash. I’m a firm believer that design is in the details and this powder room is very well designed. It’s easy to impress when you have 1.5 million dollars. Let’s take a look at the type of house you can get with one-third the budget. This is The Franklin by Payne Homes. We always appreciate it when a model home is furnished by a professional. It gives a sense of how the space can be used and helps buyers imagine themselves living in the home. It makes the property more desirable. Granite counters in this kitchen with a basket weave pattern above the cooktop. Nice details around the vent hood and tons of extra light in the glass cabinets. Surface applied moldings painted in a contrasting color with wood floor in random widths. It is the furnishings that make this room come to life – the beautifully detailed metal table base, the Greek key patterned fabric and the perfectly placed blue accent pillow. Finally, we have The Fresno Custom by Homes by Reckelhoff. They say that kitchens and baths sell houses, and this kitchen does not disappoint. Crisp white cabinets that extend to the ceiling with glass at the top, patterned backsplash tile and a pastel island make for a visually interesting kitchen. In the master bathroom perhaps my favorite detail is the herringbone pattern installation of the floor tile. The oversized white subway tile is accented with a marble mosaic in the shower that adds that perfect bit of detail to the mostly white bathroom. An empty bedroom on a house tour is a snooze, but when furniture and accessories are added the space is so much more interesting! The gentle mixing of textures with just a touch of color make this bedroom feel warm and inviting. It always amazes me how just the right accessories in a room can improve the mood. If you are considering building a new home or perhaps remodeling a space you already have, we would love to be a part of your next project! Send us a quick message and let’s make your ideal space a reality.